Since I'm so busy lately, it's been hard to put together new outfits all the time. That's why this week I decided to share a throwback. 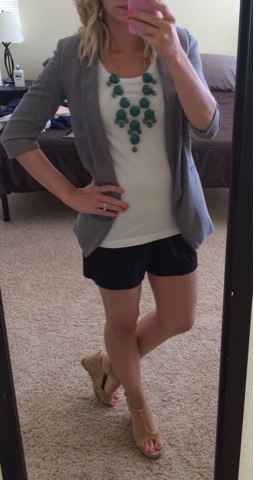 Before I got pregnant last summer, I was trying to adjust my wardrobe to the hot summer weather here in Las Vegas. I've never been a big fan of shorts, but when the weather is 90 degrees or higher for 6 months out of the year, shorts start to sneak into your wardrobe whether you like it or not. I may not like wearing shorts that much, but I do love my blazers. 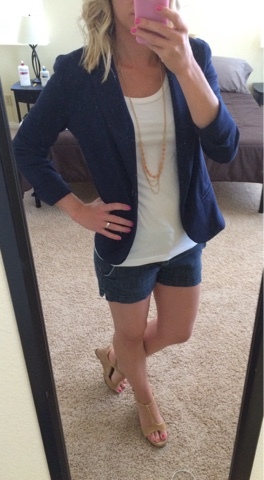 That's why I put together these 2 blazer and shorts looks last summer. I never got the chance to share these looks, because not long after I took these pictures I found out that I was pregnant. Once the morning sickness hit me, blog posts were all put on hold and these outfits never got shared. So here they are now, just in time for the weather to warm up.